WELCOME TO THE RED ANGEL HAIR COMPANY. WHERE YOUR HAIR IS OUR PASSION. The Red Angel Hair Company Ltd. is one of the hottest hairdressing brands in the North West, with salons in Manchester and Cheshire. Whichever salon you visit, you'll meet a team of talented hair stylists and colour technicians, all sharing the same passion for the industry, all offering fantastic customer service. Red Angel salons offer specialised cutting and styling teams with a wealth of experience in every aspect of hairdressing and colouring hair. So from weddings to hair-up styles for those extra special days or nights, they’re ready to provide the perfect look for any occasion. With our front of house teams supported by an entourage of full-time assistants, our contemporary salons offer a professional, friendly, comfortable and supremely stylish service from start to finish. To take advantage of the 3.2.1 all you have to do is hand out the cards to your friends and family members and they will receive 30% off their first visit, 20% off their second and then 10% off their third🙌🏼 and on top off this there are a few other little treats along the way. And if you are new to the salon and want to take advantage of our 3.2.1 offer then just contact the salon via phone or email. Please note a £7 additional charge will apply on any colour services on your first 30% discount. Discount will not be applied to children’s prices. At The Red Angel Hair Company, we believe in a totally transparent pricing system. The price you’ll pay for our Stylists and Technicians is made completely clear and is based entirely on their experience and expertise. And, because they all have plenty of both, we can't claim to be the cheapest salon around. We do however claim to be the very best. We think that’s more important. And we think that our clients appreciate that distinction. At every stage of your appointment, you’ll be treated to nothing but the very best products and the most personal attention right from the backwash to the Colour room. The Red Angels won’t stand for anything less. We’ll provide great service and fantastic value for money too. We offer all first time clients our unique 30,20,10 Intro card which gives all first time clients 30% off their first Cut, Colour (or both), 20% off their second and then 10% off their third. How's that for an incentive to come and see what we are about? *PLEASE NOTE THAT THE INTRO DISCOUNT WILL NOT BE GIVEN DURING DECEMBER AND A £7 CHARGE WILL BE ADDED TO ALL COLOUR SERVICES AFTER THE DISCOUNT. Haydn is very proud of the team we have today - (even though hairdressing was his second choice after an exciting but sadly short-lived 'Boy Band' career back in the 90's). Nowadays, he puts the client first and firmly believes that great hair and customer service that’s second to none, will take The Red Angels where they want to be. Andy has been hairdressing 12 years and his passion is evident the second you enter Red Angel. great service and great hair is obviously top of his agenda. Abi puts the 'Angel' in Red Angel. Starting as an assistant with us at age 15, Abi has become invaluable to the salon. Any client will know that Abi has everything covered and if you ever need anything sorting... Abi is the "go to girl"
Not only does she own the reception, she also has a wealth of product knowledge and deals with everything behind the scenes. Linda AKA Linners is without doubt one of the best Colour Technicians ever to wield a tint brush. With a wealth of experience spanning over 35 years (which is amazing considering she claims to be only 35 years old), she brings colour to the salon as well as the clients hair. With the condition and integrity of your hair being her number one priority, you know you are in the hands of a true professional when you sit in "Linners'" chair. First and foremost Kayleigh is a L’oreal Colour Expert… this qualification is not easy to come by and is an invaluable addition to the Funky Rouge. She is also a bleach specialist, perfect for everyone out there that wants something cool and quirky without half their hair ending up wrapped around a brush or clogging up the shower plug hole!! Lyndsay is what we would like to call a guest stylist at The Red Angel, based in South Africa he travels back to look after his clients needs over a 7 week cycle. Being the much older and less attractive brother of salon owner Haydn, he can at least take credit for helping Haydn choose his path into the Hairdressing industry. Joking aside, his reputation precedes him in the Hale and Altrincham area and we hope he keeps making the journey for years to come. Katrinel AKA the original Katie enlightened us with her presence in the U.K in 2014 and we are forever grateful that she came to us for a job first. 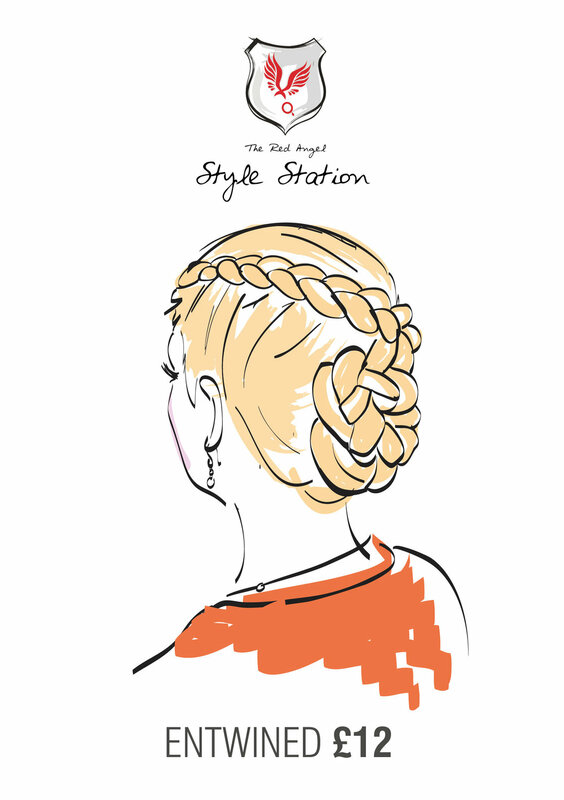 Katie is an amazing stylist but also specialises in hair-up and is at the front of all developments in The Red Angels famous Style Station. To add to her repertoire of skills, Katie is fluent in three languages and luckily for us one of them is English. Rachel is another Red Angel favourite. Starting her career with Haydn in his previous salon, he knew she just had to come along and be part of the team... and he was right!. Rachel went from strength to strength and 7 years on she is not only an amazing Colour Technician but also does a fantastic Blow-Dry and to add to her skill set, she mastered the Style Station too. You can also give Rachel credit for any songs from this decade on the salon playlist. When we stumbled upon Jade we knew straight away that we were onto a winner, with a real talent in all aspects of hairdressing but also a heart of gold. After a short stint in the Manchester salon, we couldn't wait to get her over to Altrincham, and she fits in perfectly. One of the few Red Angels to get away with insulting the boss on a daily basis... we wouldn't have her any other way. One of the most recent additions to the Red Angel team, Aden is an expert and meticulous Stylist. Clients not only fall in love with his personality but his gift for providing everyone that graces his chair with a precision cut and style the suits them and their lifestyle. With 13 years experience in the Altrincham area, Aden’s scissors are sharpened and waiting for his next creation. Joking aside peeps, if you want a stylist that is an expert in his field then Aden is the man for you. This handsome fella brings full range of services from Cutting and Styling, Colouring and even is an extremely talented Make-Up Artist. Jacobs work has featured on the front cover of some of the industries leading magazines and he has had the pleasure of working on movie sets but says that he doesn’t hold these achievements in higher stead to his day to day work, and in his words “ I’m only as good as my last set of foils or my last fringe trim’. Nikki Cuts, colours, does hair up and is even a master at the wonderful great lengths hair extensions. Nicole joined the Red Angel team back in 2013 and has now become without doubt a client favourite. Primarily a Graduate Colour Technician, Nicole is also a whizz at Blow-Drying and a salon Kerastraight Expert. Her passion for hairdressing is only beaten by her passion for receiving breakfast in bed from her mother on a daily basis. She is also the 'Go to' girl for any pot based noodle snack. Long live princess Nicole. After joining Red Angel he has decided to return to his roots of ladies hairdressing too and it certainly isn’t taking long for him to find his feet again. Girls like Emma don't come along very often, she is able to turn her hand to all aspects of running the salon and is essential to the team. We can already see that Emma is going to be a fantastic stylist and can't wait to see her career develop from here. An avid car enthusiast you are safe in her hands as long as a Lamborghini doesn't go past during a fringe trim, in which case you may lose an eye. Where do we start? Lucy was one of the original Red Angels but being her first job she felt the need to spread her wings and try her hand at other careers... She did and lucky for us she decided hairdressing was where her passion lay and recently re-joined the team. You have to meet Lucy to understand why we welcomed her back with open arms. She's fun, friendly and slightly mad but you can't help but love her and all the Red Angels feel she is back where she belongs. 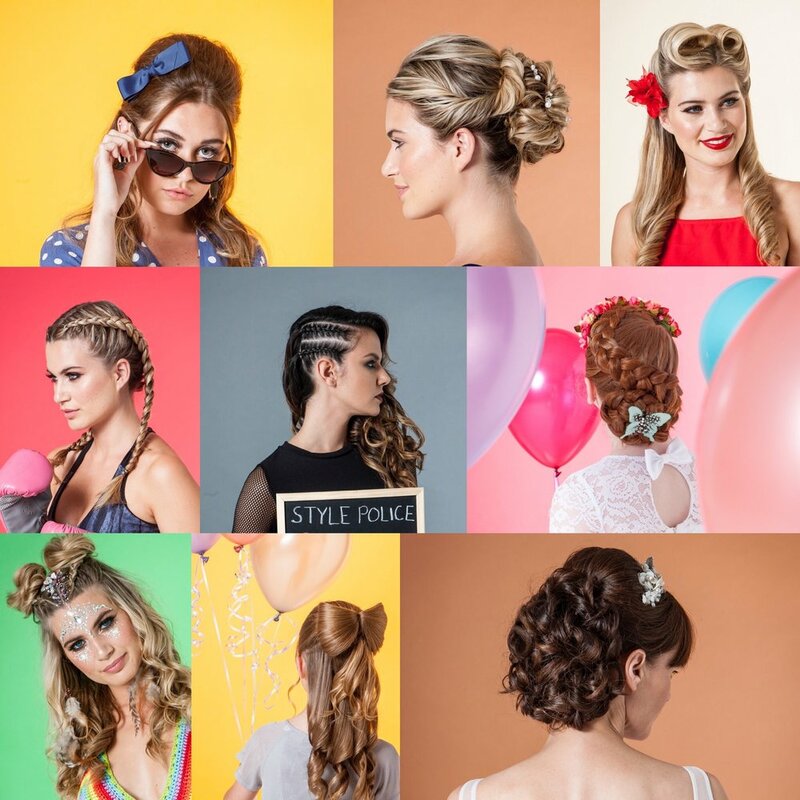 At Red Angel we firmly believe that being a hair stylist is one of the greatest and most rewarding jobs in the world. Sadly, however we also feel that many potentially great stylists don't reach the heights that their talent deserves or ever really get to see the opportunities this amazing career has to offer. We are always on the look out for true talent at Red Angel and we really believe that YOU deserve the best. Life's far too short to stand still or just plod along so take a minute and think…do you want to be the best you can be? I'm guessing you’re thinking 'YES'. If that’s you, then now is the time to take the next step and join the Red Angels. There’s a very good reason that once the right stylist becomes a Red Angel they stay a Red Angel. It’s because we offer highly competitive basic salaries with fantastic commissions and even joining bonuses up to £1000 for that local stylist that wants to bring their loyal clientele along for the ride. Feel free to email redangelhair@me.com or call 01619299809 and tell us why you should be a Red Angel. Rest assured that we deal with all job applications with complete confidentiality and value your privacy. We’d love to chat with you. After all, exploring new avenues can’t hurt. And it could lead to a great future. Getting your hair done should always be an experience, whether you're a regular weekly Blow-Dry kind of client or the 'oh my god I have to get this seen to!' kind. Whatever your style, The Red Angels like to do things a little differently and are always looking for ways to give you that little bit more - or even a LOT more of just what it takes to bring out the very best in you. Take a look below and get a taste of a few things that make us the 'Go to' salon for the greatest hair for miles around. In a nutshell we developed The Style Station as a way for absolutely everyone to never need go anywhere again without show stopping hair. And with over 30 styles to choose from, mostly priced between £9 and £12 and only taking an average of 10 minutes you absolutely can't go wrong. 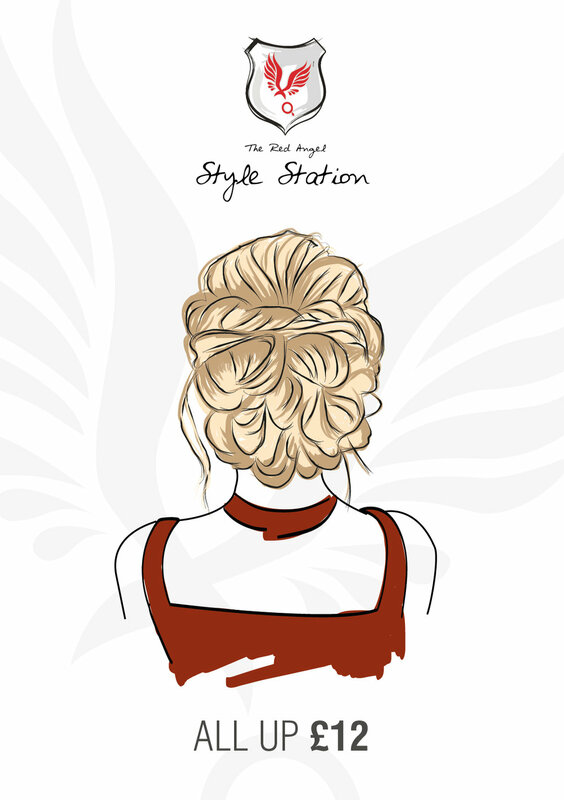 Just roll up to The Style Station with dry and reasonably clean hair, let The Red Angels work their magic, then leave totally prepared for whatever occasion awaits you. Whether that’s a night out with the girls, an important meeting, a wedding or that important date that could be the 'one', we’ve got you covered. Click the button below and thank us later. We believe that everyone is entitled to the hair they desire, the hair that truly matches their look and lifestyle, and ultimately hair that makes them feel great. The Red Angels have been providing this treatment for many years now and we stand by its consistent results time and time again. You'll have to look far and wide to find any salon that will match our introductory offer of only £100 which includes the shampoo and conditioner. Google it, research it and then give us a call and book it. Say goodbye to frizzy, unruly and unmanageable hair ladies.... we have it covered! Close your eyes for a moment and just imagine having all your hair needs taken care of for a whole year, without paying a penny for the privilege. Now open them again – because it’s not a dream! Yes, that's right. Every year, in the style of 'Willy Wonka', The Red Angel Hair Company gives every one of our clients the opportunity to win this unbelievable prize. The Golden Ticket is worth over £3000 and gives you a full 12 months of hair care with Red Angel - including free Cuts, Colours, Products and much, much more. There are lots of easy ways to enter and you are allowed as many tickets in the draw as you like. Just call or email the salon for more details of this solid gold offer. Night fever, night fever and we know how to do it! Yes, we really do. 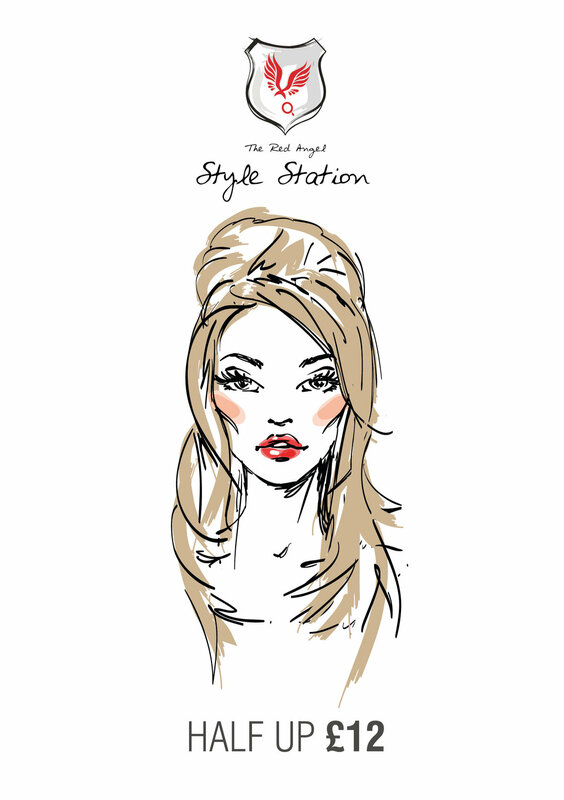 Every Friday night from 5pm - 8pm, we turn up the tunes, get out the drinks and nibbles and reduce the prices of all our Blow-Dry and Style Station services. Give everyone hair envy as you start your weekend in real Red Angel style. Our Friday nights are already taking Altrincham by a storm so click below and secure your place at the best pre-night out event in town. 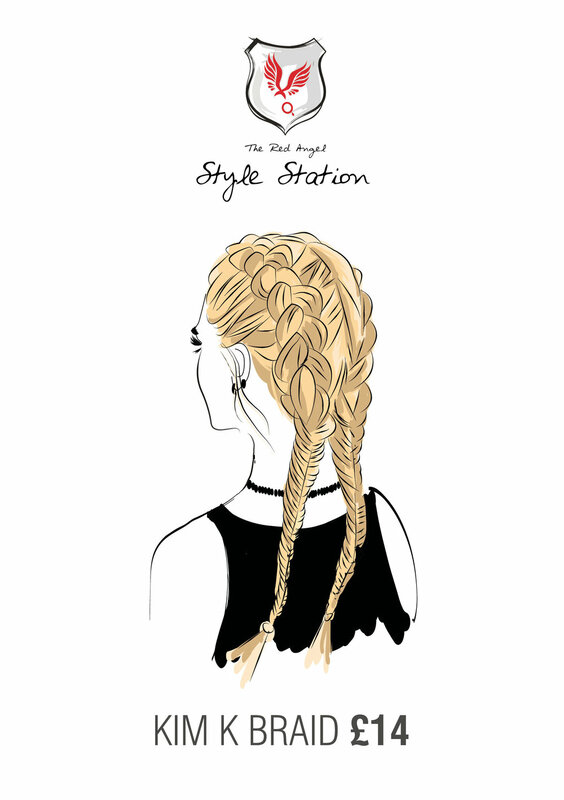 The Style Station presents the perfect pre-party experience for your little angels. Our hair and nail painting parties have been putting smiles on faces for over 5 years now and are more popular than ever. Catering from 8 - 20 children at a time, we’re sure you and the special birthday girl will never be disappointed. With a range of prices and services, we can tailor make our parties to suit your needs. With limited spaces available, we advise booking ahead to secure your place and make your little princesses' birthday dreams come true. Important news for all coffee lovers!! For us, the experience of sitting back and having your hair done for an hour or two without the stresses of life or the interruption of your beloved children should be nothing less than bliss. So imagine our horror when we heard that some hair salons, who shall remain nameless, subject their clients to, prepare yourself, INSTANT COFFEE. No, no and no again. Here at Red Angel we insist on only the very best for your caffeine infused beverage. So sit back, relax and enjoy the unparalleled flavours of nothing but Nespresso. (Of course, if you insist on instant, we can whip out the jar that’s our guilty secret). WITH RED ANGEL, LOOKING GOOD HAS NEVER BEEN MORE ACCESSIBLE. THAT’S BECAUSE WE’VE INVESTED A WHOLE LOT OF TIME AND EFFORT IN DEVELOPING A SYSTEM THAT ENSURES YOU NEVER GO TO AN OCCASION WITH HAIR THAT'S ANYTHING LESS THAN PERFECT. IT’S FAST, IT’S AFFORDABLE AND IT’S NOTHING SHORT OF YOUR HAIR SAVIOUR. 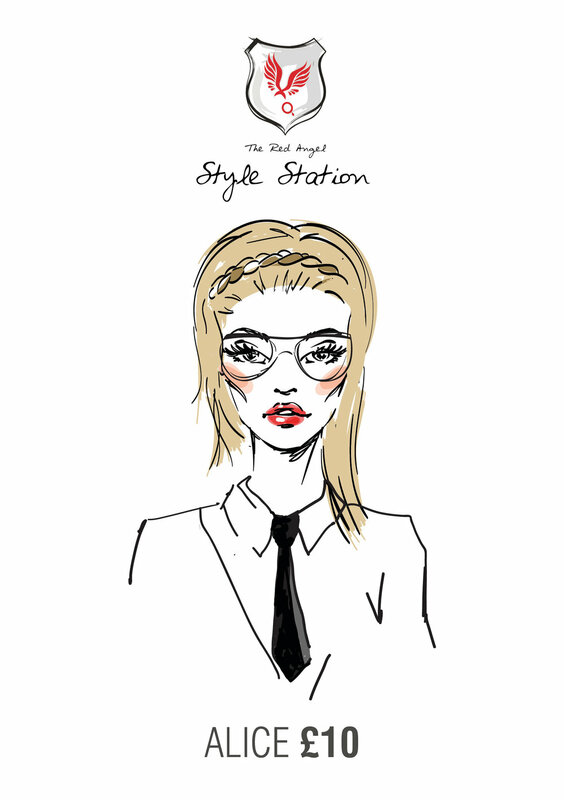 IT’S THE RED ANGEL 'STYLE STATION' AND IT”S READY FOR YOU! ALL YOU NEED IS DRY AND REASONABLY CLEAN HAIR - AND IN LESS THAN 10 MINUTES WE WILL TRANSFORM YOUR HAIR IN TO 1 OF OVER 30 STYLES. ALWAYS REMEMBER - WE'VE GOT YOU COVERED! We aim to make our pricing as clear as possible but if you have any questions please don't hesitate to contact the salon, also please bare in mind that all first time clients that book through the website are eligible for our 30%, 20%, 10% special introductory offer which is fully explained in the pricing section of the website. Simply mention you would like to take advantage of this offer when booking to ensure the discount is applied. PLEASE NOTE YOU MAY BE CHARGED IF CANCELLING LESS THAN 24 HOURS BEFORE YOUR APPOINTMENT. A COLOUR PATCH TEST IS REQUIRED AT LEAST 24 HOURS BEFORE ALL COLOUR APPLICATIONS IF YOU HAVEN’T HAD A COLOUR WITH US IN THE LAST 12 MONTHS. When you do business with us we may collect the following personal information from you: name, postal address, email address, telephone number, credit card and/or other payment information. We gather this information to allow us to process your registration, create your appointments, process any orders you may make and provide the goods requested. The relevant information may then be used by us, our agents and sub-contractors to provide you with information about your account with us or any transactions with us and to communicate with you on any matter relating to the conduct of your account in general. If you agree, we may also contact you about other products and services we think may be of interest to you. We may also wish to provide you with information about special features of our website or any other service or products we think may be of interest to you. If you would rather not receive this information, please send a email message to info@redangelhair.co.uk informing us of this. If you agree to us providing you with marketing information, you can always opt out at a later date. We may also want to provide you with related information from third parties we think may be of interest to you. If you would rather not receive this information, please send an email to info@redangelhair.co.uk informing us of this. If you agree to us providing you with third party marketing information, you can always opt out at a later date. We may also provide your information to carefully selected third parties whose products or services we believe may be of interest to you. If you do not wish us to disclose your information in this way, please send an email to info@redangelhair.co.uk informing us of this.